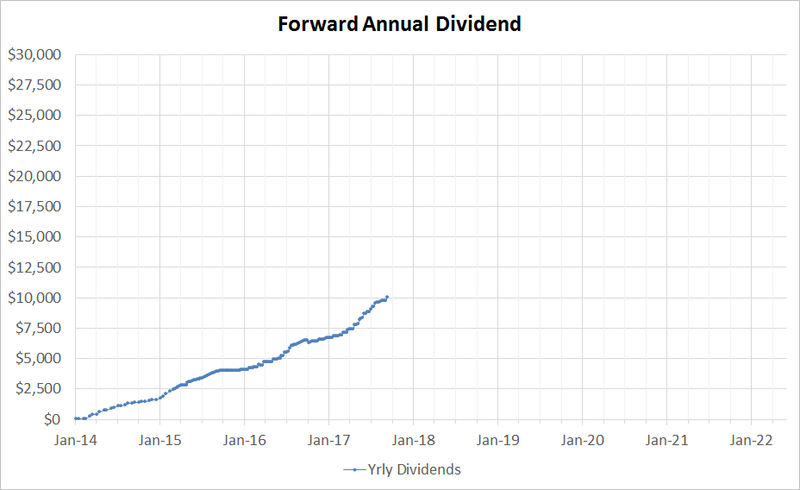 My forward annual dividend is shown below. It shows my progress so far in my last 4 years of investing. Notice how despite market ups and downs, my dividends kept rolling up. Much of the growth was from my contributions. If left alone, my portfolio would of generated around 10% growth in dividend in the last 3 years, and the current year I am expecting around mid 9% dividend growth. It is very rare for companies to cut dividends but it is not rare for companies to lose market cap on any given day. Relying on the cash flow from dividends as an indicator as opposed to monitoring the day to day fluctuations of my portfolio's dollar value allows me to act more rationally during market downturns. When my portfolio tanks 10%, instead of bemoaning the loss of paper dollars I instead look at the extra dividend dollars I can now acquire per share purchased on the open market. Here is a table showing who pays me dividends and on which month. I set my forward expectations straight so that there will be no surprises or assumptions. what's with the PEP/KO change in DEC? KO: http://www.nasdaq.com/symbol/ko/dividend-history . Coke pays on months 4, 7, 10, 12 (no idea why 12 instead of 1). They've been doing that forever. PEP: http://www.nasdaq.com/symbol/pep/dividend-history . Pepsi pays on months 1, 3, 6, 9 (no idea why they use month 1 instead of 12). They've been doing that forever also. Drives me crazy since the quarters aren't the same. WOW! I am so damn proud and happy for you. I am a little over $800 away from the 5 digit mark and this is a massive milestone! Cannot wait until you are at $12K, i.e. $1k/month... going to be legendary once you reach that. Wow, $10K. Terrific job, and an awesome milestone. Congrats! Between your additional contributions and that steady dividend growth, you'll be at your next milestone in no time. Congratulations on crossing the 5-figure mark for annual dividends! Interestingly, your highest dividend months are not quarter-ending months... those months are my highest by far. I like how you presented your expected dividend payments by month. Perhaps if I do the same I can work better on balancing out my dividends by month. Wow! Congratulations!! 5-figures in annual dividend payment is quite an achievement. And even more with your relative low yield portfolio - I really like your portfolio composition. The dividend growth rate will give you so much fuel in the future. Many of your stock picks are on my watchlist. But instead of waiting for a better price like me, you keep buying those stocks. I envy your relentless investing style. And to see how much success you have with your method is even more motivating.